From Ex-Partner to Best Friend in 8 Steps The world is too cruel to cut each other out completely. The Poetics of Self-Defense Tongo Eisen-Martin’s Heaven Is All Goodbyes reads like a volatile bus ride through San Francisco. I made it look spontaneous when I quit my job and left New York on a one-way ticket to Greece, earlier this year. In an email to my closest colleagues on my last day at work, I wrote the unfortunate, “I’m going full Julia Roberts in Eat, Pray, Love,” to cast my decision in the familiar light of millennial wanderlust. People liked that, and in emailed responses and rushed goodbyes, they acclaimed my plans to explore my heritage, see the world, and live my best life. To live such a life was, after all, the reason I gave them for leaving. What I didn’t tell them was that I was going to Greece to die. If I didn’t die there, then at the very least I was intent on returning from Greece knowing how and why I should continue to live. For months, I had been wavering between snuffing myself out or surviving, starting when my now-former boyfriend physically abused me in late 2016, sending our relationship into a fatal tailspin. The abuse added to a persistent self-hate I’d left unmanaged during the relationship, and the abrupt ending of the year-long first love disrupted the order of things in my universe. I thought I’d done everything right; I’d erased all those parts of me I knew were ugly and endeavored to be the best partner I could, even going so far as to excuse his attacks as acceptable aggression between men (they weren’t). I began to think that perhaps I was just bad and badly made. He had told me as much, anyway, in a version of what I didn’t yet know was the abuser’s refrain, look what you made me do. In the ensuing months, even after he left, I continued to erase myself, my dreams, my imagination, my ideas about who I was or would be. I erased so energetically that by late spring all that was left to exterminate was my body itself. To that end, I asked the universe to bring me into harm’s way and blithely binged on boys and benzodiazepines, because why should I bother grinning and bearing? I’d done that and been disposed of. I didn’t want to destroy myself; I just didn’t mind if something else tried to and succeeded. No matter what, I still loved the world and believed in its goodness and couldn’t willfully rip myself out of it. But what was I staying for? If I had brought out the worst in the man I thought loved me, I felt certain I would bring out the worst in the rest of the world, too. So, even as I beckoned bodily harm, I also begged a higher power to help me be in the world without being part of it, to be invisible but indwelling. Would God show me a way to do that? Would he help me find a way to stay? Seeking intercession, I began burying myself in my ancestral Greek Orthodox Christian religion, the sensorial richness of which circumvented my brain and coursed straight into my heart. Its scripted prayers put words in my mouth and stirred up the voice I’d lost; its schedule of fasting and services structured time and space I could no longer navigate. Paradoxically, Orthodoxy activated the body I hated and used it to buttress my crumbling identity; it built me back up on the bedrock of images, sounds, and symbolic gestures that had been buried in my body since the Sundays of gilded smoke I sat through in my early childhood. But I was still dangerously unstable. I was convinced real fortification would come only via a sign from God to confirm he wanted me to stay alive, and wisdom to know how to do it. I believed I could find both in Greece, specifically in the isolated and untouched “monastic republic” of Mount Athos, the sacred heart of Orthodox spirituality. The easternmost prong of the Chalkidiki peninsula, which tridents down from Greek Macedonia into the northeastern Aegean, the Holy Mountain of Athos is perhaps the holiest Orthodox place in the world outside of Israel. According to sacred tradition, the Virgin Mary, the Mother of God (adored by Greek-speaking Orthodox as Panagia, literally “All-Holy One,” but equivalent to “Our Lady”) was fortuitously marooned on the Athos peninsula around 49 A.D., for reasons the Holy Spirit has apparently neglected to disclose. One story contends a supernatural storm shifted her Cyprus-bound voyage to Athos; another, that the archangel Michael assigned it as her evangelical territory, as it were. Village grandmothers, I’m sure, have other takes on the tale, too. Regardless, we have no substantive explanation as to why the Mother of God made this place, in all of the universe, her holy garden, and we have no evidence her arrival there ever even happened. But, as with many unresolved and occasionally contradictory concepts in Orthodox tradition, the divergent threads are spooled along the sturdy rod of mysteria (“secret” or “hidden” and also the Orthodox term for “sacrament”), ends left hanging loose. Modern Athos is technically an autonomous administrative unit of the Hellenic Republic, but in many ways it’s shrouded from the world. Its land border is walled-off, and it admits only around 100 (only male, mostly Orthodox) pilgrims per day by means of a labyrinthine (but ultimately lax) bureaucracy. It adheres to Byzantine time, which marks the start of the next day at nightfall, and the Julian calendar, which reckons this year to be 7526 anno mundi. Divided from the secular world by space and time, the community of Orthodox Christian monks on Athos has nonetheless always had to grapple with the outside. Sometime around 963 A.D., Byzantine emperor Nikephoros Phokas formalized Athos as a monastic state and funded the construction of if its first grand castle, the Great Lavra, which was finished shortly thereafter. For the next thousand years, presumably a mixture of adroit political intrigue and perhaps divine protection ensured Athos’ survival through the Great Schism, the Crusades, the Ottoman Conquest, Great Power politics and even the brutal German occupation of Greece in World War II – a miraculous accomplishment, alleged divine assistance aside. Today, Athos comprises 22 monasteries whose monks are drawn from several nations and backgrounds to the Holy Mountain to “die to the world” and live only for Christ. There, in cliff-hugging castles, caves, and lonely cottages called sketes, the monks drape themselves in black, bend to the discipline of Orthodox mysticism, and pray unceasingly for the world. Through these ascetic practices, they occasionally evolve into clairvoyant, mystically wise elders. Some of them become saints. When I left for Greece in June, I went specifically to find any one of these living saints, whose existence comforted me in the aftermath of my abuse, when I dove into texts written about Orthodox mysticism. Almost superhuman, these elders had reportedly attained a state of inner stillness or hesychia that allowed them to mystically experience God. Awakened to this “uncreated light,” the elders could more clearly perceive the presence of Christ in all people, a perspective that informed the kind of Christianity they preach. Rather than an ars moriendi, it emphasizes the livingness of the sacred in the world itself. Something about them seemed to me stunted, chastened, forlorn like lonely men who were making their way to parlay with women they’d wronged but still loved. I discerned a question on each of their faces: Would they be taken back? I imagined their spirits were attuned to something about where we were going that I could only intellectualize. In theory I understood the mystery into which I was being initiated: With all the world at her disposal, Panagia favored this finger of Europe, far from her home and for which her son had performed no wonders. But even after I boarded the ferry, the Axion Esti, and even as the peak of Mount Athos itself punched up over the horizon, I didn’t feel the weight that seemed to press down on the bodies of these monks, making me fear I was unfit for this holy place. Indeed, aside from two vans shuttling pilgrims in the first hour of my walk, I would not see any other person or creature well past halfway into my ten hours of walking. By that point, I had barely covered a quarter of the 20-plus miles to the monastery, and it was beginning to dawn on me that my timing of the trip had been perilously optimistic. I had brought no food. I was wearing a 70 liter rucksack, and slipped over its straps forward-facing, a full book bag. I had never hiked in my life. I was running out of water and running low on energy, realizing too late that to traverse any distance on Athos, one must first go up. I began to get turned around; I walked down overgrown trails that branched off the main one I was supposed to follow, only to retrace my steps, pointlessly, painfully. Calling for help was out of the question: I was firmly in the interior of Athos, where there was no cell service. By the time the sun began setting, I thought, too late, about a warning I’d read on one of the Athos pilgrimage websites, which said that sleeping outside the monasteries was dangerous and forbidden. But I would have to sleep outside, alone and on the brink of exhaustion in the uncharted woods of an ancient theocracy, miles away from a monastery that would be closing its doors at sunset. Soon it would be dark, and I had no idea where I was or how far from where I needed to be. The possibility of dying was distinct here: Archaeology is generally not permitted on Athos, and as far as anyone knows, the peninsula is just a graveyard strewn with the bones of holy men and the buried treasures of shrewd monks, who from time to time fled inland from raiders to hide their monasteries’ gold. All it would take for me to be buried among them would be dehydration, dislocating an ankle, dashing my head off the dusty marble crumbled on the path. Perversely, this pleased me. It pulled me deeper into Athos’ labyrinth, farther away from worldly time and space into the lair of something – minotaur or mystery – that might devour me or make me new; either way, I didn’t care. I just walked on, feckless but not naive, feeling certain this fight against the wilderness was working its way to a close, as if I were in a backyard I knew perfectly well, and a familiar voice would call my name soon, telling me it was time to come in. After eight or nine hours of walking I fortuitously found two blue-eyed Russian laborers who gave me water and directions to a dormitory in the town of Karyes, Athos’ administrative capital. After walking another hour or so, (at what must have been well after the hour that labor-commuters left Athos) I crumpled on the roadside, racked with pain, ready to resign myself to a rough night, right as a truck rolled around the blind corner at the bottom of the road ahead of me. Its driver, an older man named Christo with the same celestine eyes as the Russians, invited me in and ferried me to Karyes for free. As we rumbled across scalloped terrain I could have never hiked in my present condition, he asked where I walked from and how far, and I strung together an answer in my sub-elementary Greek. He responded wordlessly with a gesture, cupping his hand like one cups up water to flush out freshly brushed teeth, whisking his wrist a few times. It signified a slightly salty are you really that stupid but of course you are and I pity you. I understood it because I’d seen it before. My late grandmother, my yia yia, who taught me basic Greek and gave me my earliest education in my religion, made this gesture occasionally. My mind flashed to her making it, mixing the air over morning coffee, miming the exasperation in her voice as she puffed out a “Panagia mou,” praying in passing to the Mother of God for her to protect me from my own stupidity. She must have responded to that prayer all these years later, and in about 20 minutes, we arrived in Karyes, where Christo disappeared after dropping me off at the dormitory. That night I sat awake, stricken, suspicious. Should I be disappointed or down on my knees in gratitude that, against the odds, blue-eyed samaritans had solidified in the medieval Athonite hinterland to rescue me not once, but twice? So they saved me, yes; but they saved something that was simply not worth the effort, I was sure of it. I was still sure in the morning, when I left by bus for the monastery of Vatopaidi. I stayed at Vatopaidi for only a two days, not the months I’d planned, and I didn’t have any of the metaphysical experiences or enlightening engagements with sage spiritual fathers I’d fantasized about beforehand. Of course, all around me were beautiful icons, relics, architecture and natural beauty, all of which humbled me, and during my time at Vatopaidi, I was truly “awed by the beauty,” to quote an Orthodox hymn to the Panagia, of the majesty of this faith and the God it glorifies. “Awe” attained its true meaning there: in the monastery’s central church, where the porphyry floor’s ruts remembered the feet of emperors and saints; in the ancient archives accumulated across the millennium, which are too closely guarded for casual pilgrims like me to see; and in the icons and sacred relics, such as Panagia’s spun camel-hair girdle. So many miracles reportedly occurred on account of these sacred objects that the monks only mentioned them in passing, casually, like opportune weather. That first evening, I joined all the pilgrims and monks in the trapeza, a Hogwarts-esque great hall, for dinner comprised of mostly vegan dishes prepared from food grown on Vatopaidi’s grounds. After the meal, a guest master gestured for the pilgrims to stand up for the monks to make their exit first, and I confess I felt a little forgotten as a guest when this happened. Foreign guests in Greece are, for deep cultural reasons, given great honor in all interactions, and this forceful reorientation toward the hosting monks mixed poorly with my experiences in the country so far. Worked up, I walked in line out of the trapeza, wincing when I hit the outside light, but not on account of its brightness. On either side of me, I beheld the monks who had just left the hall prostrated on the paved courtyard. Faces parallel to the ground, they were arranged like obsidian sphinxes, acknowledging with their bodies the presence of Christ in the strangers they fed, and in me, who was in the midst of mean-spirited judgment. I cast my eyes down, jaw clenched in compunction, calling silently on Panagia to pardon me. How could you? How dare you? That was all I seemed to hear inside for a while after I walked past them, impervious even to the chanting at the vespers immediately after. Later that night, I sat alone on the balcony of the Vatopaidi dormitory, hours after the other pilgrims in my room had fallen asleep. I remember thinking that I’d never seen a moon so bright, nor a countryside so dark as the Athos hills rolling out in front of me. I’d been out there in the bulging masses made ominous under the moon, on paths that most travelers had never crossed, and never would. I’d been lost in it, a body alone and entirely insufficient. All this was only abstract, however, until, out of that darkness, wolves started howling. It was a low, quiet woo that widened and then plunged into my core, a satanic counterpoint to the blooming drone of the sacred chants from earlier in the evening. I looked around at the balconies and windows that were closest and wasn’t able to see anyone else. Were the wolves singing for my ears alone? Was this howling the sacred wisdom I’d come here to receive? Were they reminding me how their mouths could have mutilated my dehydrated, damaged body had it stayed in their woods too long? Were I to have never met the heaven-eyed heroes who gave me water and a way out, that’s what could have happened to me. I could be there now, rotting among the bones of saints and bits of Byzantium’s buried wealth. The following day, during the warm, hazy afternoon when the monks worked and the pilgrims slept, making up for the sleep sacrificed to attend the five-hour morning service, I walked down to the skinny beach beyond the monastery gate. Like all the beaches in northern Greece I’d seen, there were no shells there. Instead its shore was speckled with millions of marbled stones, shards of semi-precious gems and shiny minerals shaved off of Greece. It seemed appropriate to me to take some of these stones home as my own low-rent relics of the Holy Mountain, and I cupped my hand into the grainy churn as the waves went out, curling my palm under the rocks with the same gesture Christo had made in his miracle truck. After the water receded, I craned my neck to my open palm, seeing it was now paved with jagged little Jupiters, rose, yellow and mottled white, some flecked with nickel or bronze; colors like sunrise and sunset, beginnings and ends. Certainly, they were beautiful, but with so many others around, surely there were superior ones? As I started to comb the beach, however, I fixated instead on the ugly ones, misshapen or fractured; the forgettable ones, disposable, undeserving; abused at the expense of the shore on which they shimmered and the pilgrims like me who picked it apart. I felt fiercely protective of them, for what had they done to deserve to be discarded, these fearfully and wonderfully made fragments? I wanted to fight for them as if they were precious, little living things powerless to survive alone. How could you call them ugly? How perfect they all are. 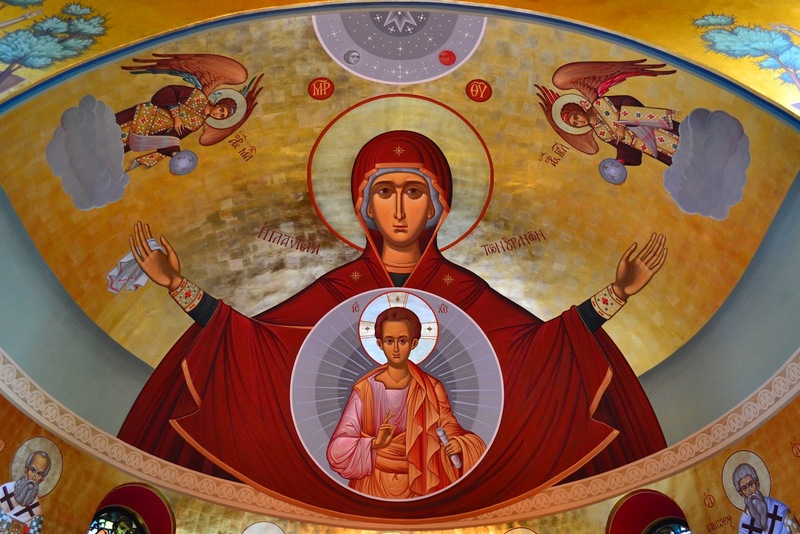 In that moment, it was as if my heart ruptured, cleaving wide like the hands of Panagia, held high and horizontal in the icon style called Platytera ton Ouranon, “more spacious than the heavens.” In a pale imitation, it was as if my heart, too, had become wider than the sky, and so heavy it must halve itself, pouring out on things beautiful and hideous alike. Here was the mystery, inside of me and in my hand, healing for just a moment what I’d thought only the wisdom of holy men could make whole. I wanted to feel like this always; I tried to grasp it immediately, tightening my mind’s mesh around it like my hand had around the pebbles I just collected. But as soon as I did, it sputtered and extinguished, and my heart sutured itself shut, shrinking back into its standard, small fist. Back in my body and blinking from the sun, I bundled my stones and started back to the monastery. I left the next day. Niko Maragos is a freelance writer from Pittsburgh by way of Florida. He is steely and sunny in equal measure, and is now based in NYC.